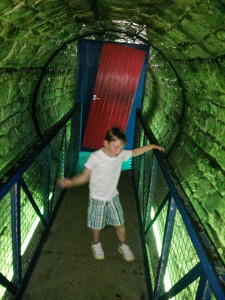 We visited Flambards Theme park earlier this year whilst on holiday at St Ives Cornwall. As well as being a usual theme park with funfair rides Flambards is educational with a large exhibition, museum and a hands-on science centre. There are a good selection of rides for children. 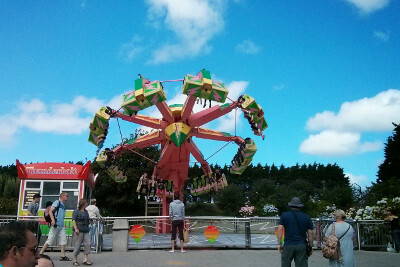 There are some rides suitable for older children and adults. There are no really big roller coasters as this is a theme park more appropriate for children, but there are still a few rides for older children and adults. The main large rides includes the Thunderbird ride (shown below), a log flume, vertical drop tower and a dark tent light show ride. 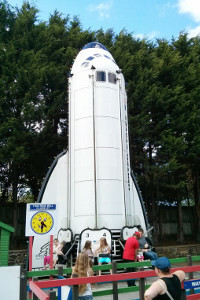 The children's rides include rides a good selection of rides, from rides suitable for young children to some mini version of the older persons rides such as the space shuttle ride. Most of the rides are included in the admission price, but there is a small additional charge for some children fork-lift trucks and motor boats and additional charge for the Go-karts. 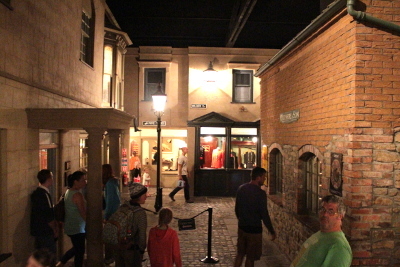 The main part of the exhibition area at Flambards is a Victorian village. This is indoors with some buildings that you walk through and others (such as shops) where you can look through the windows. It is complete with wax works depicting people in the rooms. There is also a Blitz experience and a museum with a mix of different memorabilia. The main theme is in military exhibits including a section on the Falklands war. I thought that part was particularly interesting as it's something I remember from my childhood, but haven't seen in other museums. There is then a mix of unconnected small collections such as the Blue Peter lifeboat (another memory from my youth) and a prototype cockpit of the Concorde. If you are just interested in the museum and exhibits then there are exhibition only days where you can explore those at reduced admission price. The science hands-on experience tent is a good feature, although I am a little biased as I am a volunteer STEM ambassador, which includes helping teach science to children. There are a number of different hands-on science experiments. A particularly good one involves crawling through a room full of laser beams - James Bond style, and the one I found most impressive is the "wobbly bridge" that didn't move, but was difficult to walk across. I knew what was going on, but whatever I did my body still kept trying to compensate for what I was seeing. Flambards is a theme park that is great fun for children, but also includes some good educational attractions including the museum and science hands-on experience. The educational attractions are indoor so works well for wet days. There is a free / reduced price return visit included in the entrance fee so worth going back for a return visit if you have time.